Main features of the new "LUMIX S1R" and "LUMIX S1"
・"Low-pass filterless 35mm full-size CMOS sensor with "Venus engine". ・It supports world first 4K60p video shooting in a full-frame Mirrorless interchangeable-lens camera. ・The camera's shake reduction technique "Dual I.S." deployment. Handheld shooting is now possible even in total darkness and with distant subjects. ・Dual card slots : -Panasonic first XQD memory card and -SD memory card. ・Equipped with 3 solid axis pulse tilt liquid crystal. ・L mount adoption of Leica Lenses. The Panasonic Lumix S1R is a full-frame mirrorless camera with 47.3 Megapixels, built-in stabilisation and 4k 60p video. Announced in September 2018 and previewed in February 2019, it’s one of two bodies launched by Panasonic as part of its L-mount alliance with Leica and Sigma. The L-mount alliance is a partnership between Leica, Panasonic and Sigma to develop cameras and lenses based on Leica’s existing L-mount. Panasonic says it will continue to develop Lumix G Micro Four Thirds products alongside the new full-frame Lumix S system. Like Sony and Nikon, Panasonic has launched two full-frame mirrorless cameras different mainly by resolution: the S1 with 24.2 Megapixels and the S1R with 47.3 Megapixels. The S1R series currently has the highest resolution in that category. A high resolution mode, shifts the sensor to deliver a composite image with up to 187 Megapixels on the S1R or 96 Megapixels on the S1. Like its Lumix G cameras, Panasonic is implementing a Dual IS system with up to 5.5 stops of compensation thanks to body-based stabilization working in combination with optical stabilization in the lenses, and Lumix S continues to buck the trend of embedded phase-detect AF by employing a 100% contrast-based DFD autofocus system, although this works down to extremely low light levels of -6EV with a fast enough lens, and new AF software supports face, eye, body and even animal detection. As with Lumix G, video is a key feature for Lumix S with both bodies supporting 4k 60p, making them the first full-frame cameras in their class to offer the capability; on the S1R you can record up to 30 minutes in 4k up to 30p or 15 minutes in 50 / 60p. The S1 allows longer recording times of 30 minutes in 4k up to 60p, or unlimited in 4k up to 30p, and will also support 10 bit recording internally up to 30p or externally up to 60p with an optional paid firmware update later in 2019. Note on the pre-production samples I tested, the S1 only allowed uncropped 4k up to 30p and applied an APSC crop at 50 and 60p. In contrast the pre-production S1R I tested allowed uncropped 4k up to 60p, although you could optionally apply an APSC or an even tighter 1:1 crop if desired for more reach. Cropping specs may change on final production models. Completing the specifications, the Lumix S1 and S1R offer 100% weather-sealing, a 3.2in touchscreen that can flip up and down and out sideways like the Fujifilm XT3 (although sadly not facing forward), an industry-leading 5.76 million dot OLED viewfinder with 0.78x magnification, dual memory card slots (XQD and SD), 9fps bursts in single autofocus or 6fps with continuous autofocus, Panasonic’s unique 4K and 6K Photo modes, 1080 video up to 180fps, and a fast flash sync speed of 1/320. Panasonic will have three native lenses at launch in early 2019: a 50mm f1.4, 24-105mm, and 70-200mm. Panasonic promised a further seven by the end of 2020, and with a Leica L-mount, the S1R and S1 will also be compatible with all of Leica’s existing and future SL lenses; 42 L-mount lenses are promised by the end of 2020 from the alliance in total. across the entire frame; double the resolution & processing speed. The GFX medium format mirrorless digital camera combines a large 102MP CMOS sensor with high-performance GF lenses to deliver unsurpassed image resolving performance and color reproduction capability. This large sensor features high speed phase detection AF, first seen in the X Series range of mirrorless digital cameras. Phase detection pixels are embedded at high density across the sensor surface to provide high speed autofocusing with excellent accuracy. The superior image quality coupled with the fast phase detection AF allows the camera to reach a new audience in moving subject medium format photography. A rangefinder-styled version of the GFX 50S that was first announced at the 2016 Photokina. The GFX 50R is 145g lighter than the 50S, and is 25mm thinner. even easier to handle & operate than the 50S. As with Sony’s other popular Alpha 7 and 9 series cameras, the new Alpha 7III is a full-frame mirrorless camera, a class of camera Canon and Nikon have yet to offer, though similar models are promised. The dark shadows in underexposed nightscapes withstand shadow recovery better in the uncompressed files. Compressed files have more noise and magenta discoloration in the shadows. 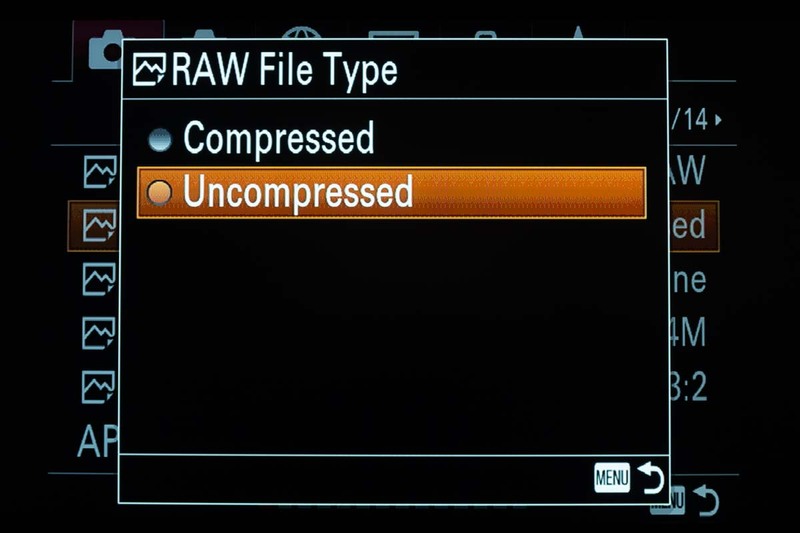 Nevertheless, for the demands of nightscape and deep-sky shooting and processing, shooting Uncompressed Raws is recommended. Use Compressed only if you plan to take lots of time-lapse frames and need to conserve memory card space on extended shoots. Here are some other Sony a7III features found to be of value for astrophotography, and for operating the camera at night. To reduce battery drain it is possible to turn off the EVF completely – rarely used at night- and to turn off the LCD display when shooting, though the latter is an option you have to activate to add to the Display button’s various modes. But when shooting aurora videos , the shutter speeds could be "dragged" as slow as 1/4-second, fully 4 stops better than the Nikon’s slowest shutter speed of 1/60 second in Full HD, and 3 stops better than the Canon’s slowest movie shutter of 1/30 second. Coupled with a fast f/1.4 to f/2 lens, the slow shutter speed allows real-time aurora shooting at “only” ISO 6400 to 12,800, for quite acceptable levels of noise. Real-time video of auroras is not possible with anything like this quality with the Nikon , and absolutely not with the Canon. And neither are 4K. The EOS Canon C700 FF is a new full frame cinema camera, outfitted with a 20.8MP CMOS sensor plus a triple DIGIC DV 5 processors. Announced on March 28 and was on-hand at NAB 2018 this week. Capable of capturing 4K ProRes and XF-AVC file formats, as well as 5.9K RAW at up to 60 fps using the optional CDX-36150 Codex Recorder. Delivering 15 stops of dynamic range, IP streaming and support for multiple LUT formats. Offering internal 4K/Super35 crop up to 72 fps and internal 2K/Super16 crop up to 168 fps. Canon Cinema EOS users will be familiar with the overall design and layout of the camera controls. Internally, the camera features two CFast card slots and one SD card slot. Plus 4 SDI outputs and 1 HDMI out, along with 2 monitor SDI outputs. The new camera is available in both EF and PL mount options. As a full frame cinema camera costing about 27K€, it's at top of Canon’s Cinema EOS series. Canon announced the EOS C700 FF, as the Company’s first full-frame cinema camera. The beauty and majesty of full-frame digital cinema is now becoming a new creative reality. Since the introduction of the EOS 5D Mark II DSLR camera in 2008, Canon has been a part of the full-frame video movement, and the introduction of the C700 FF has reinforced Canon’s commitment to this market. At the heart of the camera is a novel Canon-developed CMOS image sensor having a total of 5952 (H) x 3140 (V) photosites with a digital cinema 17:9 aspect ratio, which gives it the same image circle size as the full frame EOS 5D camera series. This supports a wide range of shooting options. Available in both PL and EF Mount, the EOS C700 FF provides users with the same outstanding performance, operation and modular design as the EOS C700 (released in December 2016). Since the launch of Canon’s Cinema EOS line of products in November 2011, Canon's goal was to one day develop a cinema camera worthy of being the ‘A’ camera on major film productions, and Canon met that goal with the introduction of the EOS C700. Responding to customer feedback and closely monitoring market trends, Canon set forth a new goal: to launch a full-frame cinema camera. With this introduction, it was certainly exciting to see the C700 FF in the hands of industry professionals. Existing owners of Canon’s original EOS C700 cinema camera will be pleased to know they can have their Super 35mm sensor upgraded to the new Full-Frame sensor for a fee*. Authorized Canon facilities able to process C700 upgrades as well as lens mount swaps, and offer equipment drop off, on-site repairs and upgrades, as well as equipment testing and demonstration. A 5.9K (5952 x 3140) CMOS 38.1 x 20.1 mm full frame sensor as the engine. Plus 15-stops of dynamic range and 5952 x 3140 12-Bit RAW recording (external only) these are head turning specs and absolutely worthy of the “cinema” name on paper. Keep in mind while shooting in 5.9K you’ll have an aspect ratio of 17:9 with the camera, which especially lends itself to anamorphic shooting. 4096 x 2160 at upto 60 fps in-camera. Step down to 2K and you can record internal XF-AVC 4:4:4 12-Bit to two CFast 2.0 slots. The codex external recorder is not a cheap investment at about 5700€ (not including storage SSDs), but in my mind it is an absolute necessity if you want to really put the C700 FF through its paces. I’ve always liked the image out of the C700 and the Full Frame version looks great in the booth, but we’ll need to get our hands on the camera to judge how the image holds up in the field. The 20mm fills a gap between the 14mm and the 24mm bringing the Canon Cinema Prime set to a total of seven lenses. While the T-stop varies throughout the line, the 20mm covers full frame and lands at a very speedy T1.5. Addition of a 20mm to your kit may be a good idea. The C700 line, with the addition of full frame, seems to be on the right track as a major competitor in the high end cinema camera field. According pro sources, the Alexa sensor has a wide pixel pitch allowing for great low light performance as well as the ability to resolve rich detail in shadows and smooth gradation in highlight roll-off. The Alexa mini, when shooting in open gate, full resolution mode at 3.4K translates to roughly 7.5 megapixels when individual frames of video are extracted and processed into still photos. The sophistication and quality of this imaging system present a unique opportunity to combine professional digital cinema capture with the ability to simultaneously create publishable photos. After colour grading a Log C image from an Alexa Mini, you can continuously output photos of each frame. With the Alexa’s rich skin tone detail, this presents a unique option for high-end fashion stills. Combine this with the Alexa Mini’s ability to capture high-resolution in stunning detail and you have an underrated recipe for visual magnificence. Capturing slow motion digitally on the Alexa allows for stunning video and professional stills to be created at the same time and when post-processed and mastered usable for ultimate release and publication. 7.5 megapixels are more than enough to create a high-quality print roughly the size of a magazine page. The maximum dimensions one could create a high-quality (300ppi) print from a 7.5mp image are 10.5”x 7.75”. This means that, from a technical standpoint, one could easily create high-quality imagery and video simultaneously for broadcast and for print when looking at using the Alexa Mini for stills and video. With the Alexa’s sophisticated colour science and internal processing, the benefits of using it for magazine-sized prints are easy to see. Combining still photography and cinematography units on a set that requires both would reduce the cost of the production, as one operator and camera crew could be hired to execute the raw masters that would be used to create both the release video and photo prints. The ARRI Alexa revolutionised the very nature of digital cinematography. At its core, the Alexa possesses a nine-year-old sensor design that has become the gold standard of the motion picture industry. Favoured by cinematographers everywhere, it has helped to bridge the transition between film and digital. Today’s world of modern DI computer carts recording raw bayer data streams from high-tech camera systems is a far cry from the early days of keeping film mags safe from the elements. ARRI cameras were there the whole time, with their 100-year anniversary on the horizon. Will they announce some new groundbreaking tech? Time will tell. When Arri debuted the new Alexa 65 system at Cinec 2014, a tectonic shift in the industry occurred. The era of medium format cinematography had arrived. ARRI announced that the sensor design is identical to that of the Alexa, though much larger in scale. This is a testament to the integrity of the Alexa sensor’s engineering design. Want greater resolution and a larger sensor? No problem, ARRI dropped the Alexa 65 behemoth and reinvented the 65mm format for the digital era. Vision Research attempted to create a 65mm industry standard camera with the Phantom 65 but that imaging system is no longer in production. When more Alexa 65 units are available in the future, the potential is unlimited. It becomes more likely that in the future landscape of media, professional stills and video will likely merge using the same camera crew. A 65mm image plane is medium format, the favoured format of still photographers worldwide. With its massive imaging plane, a 65mm negative creates a lifelike impression of its subjects, rendering an organic image with an incredibly fine grain structure. On high-end productions, if an Alexa 65 could be sourced for a stills and video campaign, both tasks could be executed simultaneously by the same technician. This type of lensing would likely produce some truly amazing end results. After all, the vintage lenses for the Alexa 65 that ARRI markets as vintage 765 are simply rehoused Hasselblad stills lenses, the brand favoured by pro photographers worldwide. Combine the amazing image quality of a medium format Alexa sensor paired with some of the best optics in the world, and the possibilities for the convergence of cinema and pro photography are looking very bright. The resolution provided by a still extracted from an Alexa 65’s raw data video stream, could be used to create a high-quality billboard. The ability for companies to create medium format digital cinema and 300dpi billboard size equivalent prints satiates the majority of current broadcast usages of visual imagery currently employed in modern media. Using the ARRI Alexa camera system provides a powerful platform to create stills and video. This camera’s strength in resolving skin tones makes it an exceptional choice for productions worldwide. When the Alexa is used concurrently to create motion and stills, this streamlines the editorial and post process, eliminating the need for hiring multiple technicians. The promise for economic savings for advertising producers worldwide is also quite appealing when considering the combination of the two roles for video and photo into one streamlined unit. This would enable companies to save on costly investments by not having to hire two separate professionals, one video and one for stills, but rather to pay one camera crew to perform both tasks simultaneously. highly versatile addition to your camera system. for specialized shots, with a well-trusted system. Copyright © 2019 NEKOVA. All Rights Reserved.